Life has been crazy around here lately. First off, our school day has been extended through the remainder of the year to make up for lost time for all the snow/fog days we had. So, our 1st grader goes in at 8:15 AM – and doesn’t get home until around 4:45. Then factor in homework, Cub Scouts, and baseball practices/games into our schedule…and it doesn’t leave much time for a good, home-cooked meal around the dinner table. 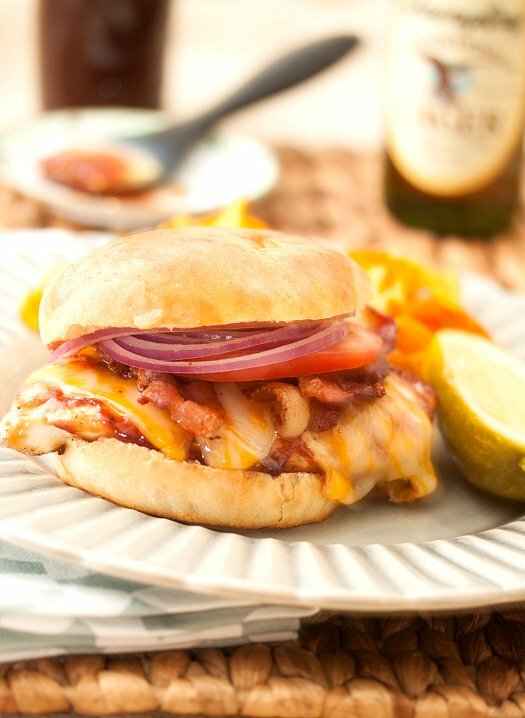 This chicken sandwich is an answered prayer on those evenings! A chicken cutlet cooks up quickly on the grill or in a skillet, brushed with a flavorful barbecue sauce, then piled with bacon and melted cheese. Throw it on a bun, and dinner is done! They’re even great wrapped up and taken “to-go”, to later be enjoyed at the game (or on the beach!). I added a slice of tomato and onion for a little extra flavor and crunch, and I thought it worked nicely with the other components. I served alongside some sweet potato chips and a pickle, for a quick dinner. Another great, quick recipe to have under my belt for those nights when life is just – crazy! With a very sharp knife, cut the chicken breasts in half down the middle. You’ll end up with 4 chicken cutlets. Season with salt and pepper. Heat grill or skillet to medium-high heat. Cook chicken breasts for about 3-4 minutes on each side. Brush chicken breasts with barbecue sauce, and cook for about 3 minutes more. Carefully place a small handful of shredded cheese on each of the chicken breasts, followed by about 3 pieces of bacon on top. Cover, and let cook until the cheese is melted. Place topped chicken breasts on buns, top with lettuce and tomato, and serve. Or, wrap in alumium foil to enjoy later (within 3 hours).